From Oklahoma! in 1943 to The Sound of Music in 1959, the musical theatre collaborations of Richard Rodgers and Oscar Hammerstein II were legendary–on Broadway, in films, and on television. Beginning with Oklahoma!, the two introduced a number of new storytelling elements and techniques that included the use of song and dance to convey and advance both plot and character rather than act as a diversion from the story, and the firm integration of every song into the plot-line. Additionally, their works addressed such social issues as racism, domestic violence, sexism, and classism. Caitlin Brooke in A Grand Night for Singing at Broadway Rose Theatre Company. Photo by Sam Ortega. So it only makes sense that, based on their body of work, a musical review would be created. A Grand Night for Singing is that production. Conceived by Walter Bobbie, with musical arrangements by Fred Wells, and orchestration by Michael Gibson and Jonathan Tunick, the show opened on Broadway in 1993. It is now onstage at Broadway Rose Theatre Company. 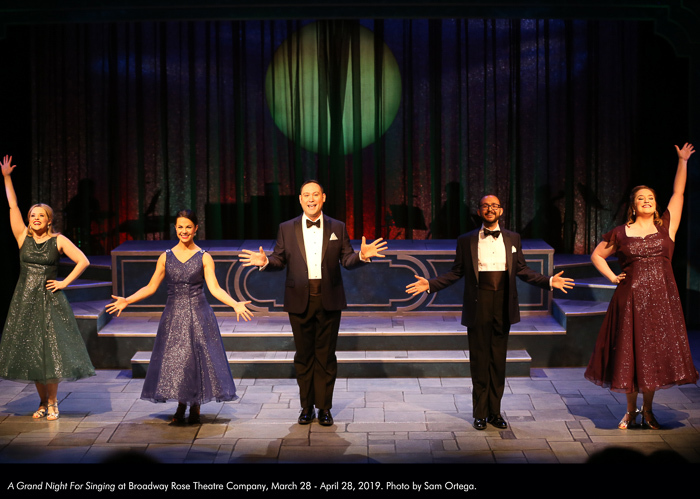 Directed by Broadway Rose artistic director Sharon Maroney, A Grand Night for Singing brings to the stage 30 of Rodgers and Hammerstein’s greatest hits. As musical reviews go, this is as good as it gets. Each song has its own special charm. It’s a great selection of the best of the best. What I love about Rodgers and Hammerstein is that the songs are situational. Even when you don’t know the bigger picture of the play, each song tells a story of it’s own. For example, in “The Surrey with the Fringe on Top” in Oklahoma, the audience is privy to a proud guy showing off his new ride, not to mention his horses, to a new romantic interest. Not only do we learn all the features of the vehicle, there’s also a thunderstorm! Kelly Sina and Joe Theissen in A Grand Night for Singing at Broadway Rose. Photo by Craig Mitchelldyer. “Maria” from The Sound of Music is a song about an endearing but mischievous novice nun, but it could be about a troublesome girl friend. It’s not all fun and games. “This Nearly Was Mine” from South Pacific is a heartbreaker. The show is performed by five talented singers–Caitlin Brooke, Joey Cote, Deborah Mae Hill, Kelly Sina, and Joe Theissen–with minimal acting. Music direction by Jeffrey Childs and Dan Murphy’s choreography direction are spot on. The creative team also includes Braden Graves, scenic designer; Darrin J. Pufall, costume designer; Gene Dent, lighting designer; Brian K. Moen, sound designer; Jeff Duncan, production manager; Phil McBeth, technical director; and Jessica Junor, stage manager. A Grand Night for Singing runs through April 28 at the Broadway Rose New Stage, 12850 SW Grant Avenue, Tigard 97223. Top photo: Deborah Mae Hill, Kelly Sina, Joe Theissen, Joey Cote, and Caitlin Brooke. Photo by Sam Ortega.